Located on the edge of an Area of Outstanding Natural Beauty and a hamlet in Buckinghamshire the Oak House is a delightfully special eco-home. The interior is light and airy and organised around the family’s shared passion of music. 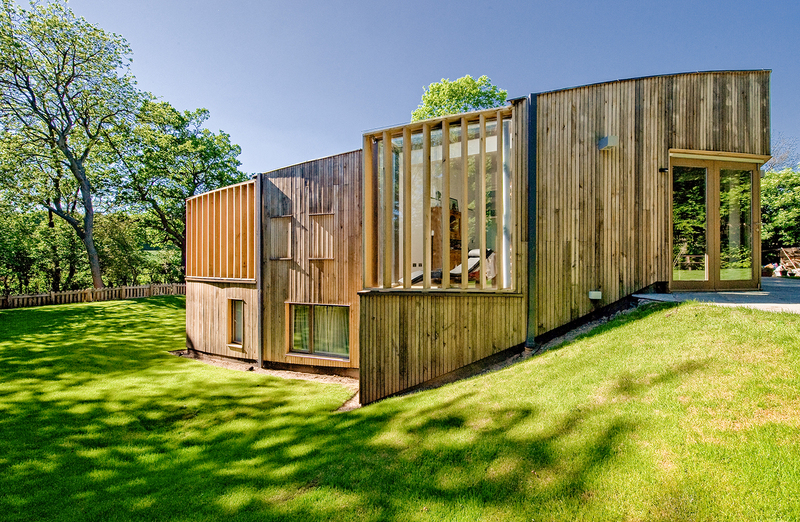 The curved design and window bays allow stunning views towards the distant hills, whilst the green roof and oak cladding enable the building to sit in sympathy with its surroundings. There is a carefully integrated energy strategy for high-thermal performance and environmentally responsible energy consumption. There is a carefully thought-through acoustic strategy for a home filled with music lovers that are able to play and practice instruments without disturbing the rest of the house. The project has won numerous awards for its sustainable energy strategy and for the acoustic considerations.